Flash marketing business leader collaboration partnership projects for mutual benefit. Get your business products and services in front of potential new customers. Working together on business promotion marketing and advertising. Business experts business owners and risk professionals work together go grow their own brand to reap rewards from each flash marketing project. Projects that work are easily repeated for nominal cost. We are looking for new partners for the development of new business plans for sustainable growth. Grow your business locally and globally today. 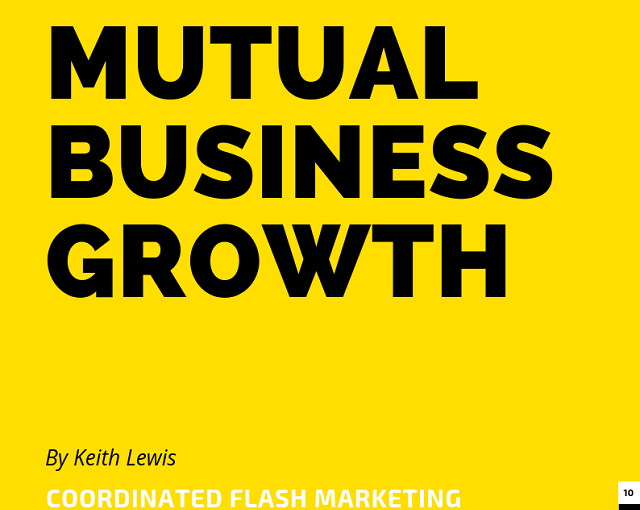 How do I benefit from mutual growth partnership? Get into a mutual growth relationship with BusinessRiskTV below. Subscribe for free for more information. We pool business marketing resources to hit targeted market sector industry area city or country. As this form of marketing and promotion is cheap it is highly sustainable for mutual long term growth. Partners to the flash marketing project work together to find best way for mutual benefits. When working with our partners we are keen to support the growth of your business by working within realistic timescales and existing business resources. Set your business up for business growth through improved business performance. Grab a bit more market share with little upfront costs. Beat your competitors to new customers. Outperform your business sector or industry business rivals.